Teatime is a pretty big deal in Turkish households. It is a wonderful ritual of taking tea at five in the afternoon with family and friends where one can sit, relax and enjoy the moment. It can be a challenge to practice this during the week when we are here in the States (in Turkey, even at work there is teatime) but the weekends are ours to do with as we please and five o'clocks at home are reserved for teatime on Saturdays and Sundays. The tea is usually accompanied with some kind of pastry, which can be salty or sweet - (preferably one of each). There are also times when the accompaniments can become extravagant and go beyond mere pastries to include what would be considered "real food". My husband asked if I could make mercimekli kofte (let's call them lentil fingers, for lack of a better name) for tea today and I decided I could indulge him just this once since it's our anniversary. Both my parents come from South Eastern Anatolia and mercimekli kofte is one of this regions most famous delicacies. Lentil fingers are made with red lentils (mercimek) and cracked wheat (bulgur) which is one of the chief ingredients in Eastern Anatolian cuisine. I have a great recipe that comes out perfect every time... It only took me half an hour to make this. Put the lentils and the water into a pan and let it boil. Once it starts to boil, turn down the heat and let it simmer til all the water is absorbed and the lentils are soft. While the lentils are cooking, in a separate pan saute the diced onions with the olive oil, tomato paste and pepper paste. Take the pan off the heat and add the cracked wheat, cover, let it sit for 5-7 minutes. The onions should have turned a translucent color by now - take that pan off the heat and let it sit and cool. Turn the contents of the pan with the cracked wheat and lentils into a big oven tray (somewhere easy to knead it) Add the salt, pepper and cumin. Mix and knead the combination til the cracked wheat softens. I usually taste a little bit to see if I can still feel the crisp of the cracked wheat - if you can - you have to keep on kneading. Rule of thumb for someone who has never had this dish before- it should be as soft as your earlobe and not crunchy at all. Once your mixture is soft enough, then add the olive oil mixture and mix well. Add the parsley and the green onions and you are ready to make the lentil fingers by squeezing them in your hand. You can serve them topped with parsley and green onions. Enjoy! Ramadan, the most wonderful, fulfilling and benevolent of all Islamic traditions has been one of my favorite times of the year for as far back as I can remember. There are scenes from my childhood that resonate with a warm family environment where everyone is quiet and contemplative, sitting around the table laden with all kinds of delicacies awaiting the faithful, who have been fasting since sun-up to partake of the feast set before them. The minute the sun sets and the call for prayer can be heard reverberating throughout the streets, it's time to eat, and the calm and expectant setting turns into a hive of activity as the hungry are fed and everyone is trying to oblige them in the offerings prepared especially to their tastes. After the first pangs are satiated everyone is eating, talking and laughing all at the same time. The food keeps on coming one after another for what seems to be an endless amount of time. There is a traditional 'Iftar Sofrasi' (the table set for the meal of breaking the fast) that follows a particular order for practical reasons more than anything else. The table is set with what the Turks eat for breakfast - cheese, olives, tomatoes, cucumbers, jams and sometimes 'pastirma' (a beef cured with spices that has been dried / smoked in the sun) or 'sucuk' (garlic flavored Turkish sausage); all of this is eaten with a special 'pide' (pita bread that comes out only during Ramadan). The fast is broken with something that hasn't touched fire, either olives, dates or water. Fruit juices, water and soda are beverages served with the meal; most Turks don't drink alcohol during the month of Ramadan. The first course that comes out is always a soup to help with digestion. 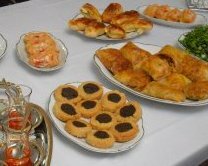 One or two olive oil dishes and some sort of borek is usually on the table also, as a starter, before the main meal. Everyone samples a little bit of everything while the little tea glasses are never left empty. After the main meal, a big a variety of deserts and fruits are brought out but the special desert of Ramadan is 'Gullac' (thin layers of starchy dough drenched in sugary milk and served topped with crushed walnuts, pistachios or pomegranate seeds.) 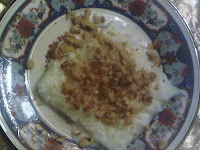 It's a delicate, delightful desert that is a favorite in our family, my sons look forward to this time of year, if for no other reason than to have this desert that is available, for some unfathomable reason, only during Ramadan. This year, the month of Ramadan, was over without any of us realizing that it had even started. It's always difficult to get into the spirit of any holiday that is celebrated away from familiar surroundings; we are not a very religious family except for my mother and remembering it is Ramadan when no one is fasting and there is no acknowledgement around anywhere, makes it almost impossible. All of these excuses must seem pathetic to the truly devout but this is a fact about the culture we grew up with in Turkey. We are not ruled by the 'sharia laws' but have a democratic constitution that allows for freedom of religion. Although almost %98 of the country is supposed to be Muslim, nothing in Turkey is similar to any other Muslim country. People are free to pray and practice their own religion the way they choose to; most of the people I have known have found their own interpretations of Islam that, I think, is unique to only Turkey. When we were living in Turkey, I used to fast almost for the whole month of Ramadan; it is a great time for cleansing your soul as well as your system. Fasting helps to ingrain patience, humility and gratefulness. It's a great way to recognize all that we have in our own lives to be thankful for, almost like Thanksgiving, but for a whole month. I wanted to share with my children this wonderful concept of abstaining as well as sharing with those less fortunate, that is such an important part of our country's cultural traditions. This year we were able to catch only the end of the month before it was completely over. My younger son, Murat fasted for one day during the day of 'Kadir Gecesi' which is to be the most important day of Ramadan when the Koran was supposedly revealed. Fortunately, we were able to share this wonderful tradition with my brother Cenk and his wife Wendy, with little Prometheus joining us at the table only briefly. It was so great to be able to share this poignant part of our heritage with Wendy. Murat gave me his list of must haves for the iftar -lentil soup, borek with ground beef, and a fried egg along with the usual breakfast stables. We were never too big on the main meal during Ramadan and couldn't seem to get past the soup and borek, so the meat I prepared for this night was for the rest of the family's benefit. The day before the planned 'iftar', Mehmet and I went shopping for the authentic breakfast supplies from a Turkish grocer, Ethnic International Holding, Inc. in Cranbury, New Jersey. The whole shopping expedition was a such a happy occasion. I found all the specific brand name products I was looking for, from the sheep's milk white cheese (some call it feta) and special green olives to the halvah and even sour cherry juice. The preparations were quite easy, once we had all the materials ready. I only had to make the soup and the borek, the meat would cook all by itself anyway. Finally, at 7.30 in the evening, it was time... we all gathered around the table and waited for Murat to break his fast. He savored everything I had prepared for him and we all relished the chance to take part in an important tradition, as a family, in such a distant land. I was grateful that Murat had fasted that day and made the whole experience real for all of us. Cenk, Wendy and Prometheus left to go back to Los Angeles at the beginning of the week; we are back to our nucleus family of six. Everything returned to normal, we all went back to work and school and the 'iftar sofrasi' we shared with the whole family became nothing but an exotic, distant memory. But today, it is the second day of 'Ramadan Bayram' (Ramadan holiday), marking the end of the month of fasting; thanks to the lucky coincidence of it coinciding with Rosh Hashanah we have a vague perception of a holiday ourselves. This is actually suppose to be a three day celebration that is commemorated by visiting friends and relatives. For those of us who live away from most of our friends and relatives which this holiday would be significant to, have to settle for Facebook posts and long distance phone calls. 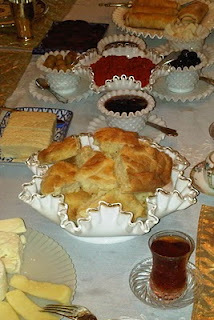 For our family in New Jersey too, life would have been 'business as usual' if we hadn't made a point of sitting down to an especially prepared 'Bayram breakfast' yesterday. I tried to set a cheerful table laden with all Turkish specialties. We got the boys out of bed by force, and made them sit outside with the rest of us, in the morning chill of a beautiful fall day and humored their complaints about the cold and the hour and how strange we were...We celebrated as best we could, enjoying the camaraderie of dancing to our own tune.